In this lesson we will look at Evaluating Trigonometric Functions Using the Reference Angle. 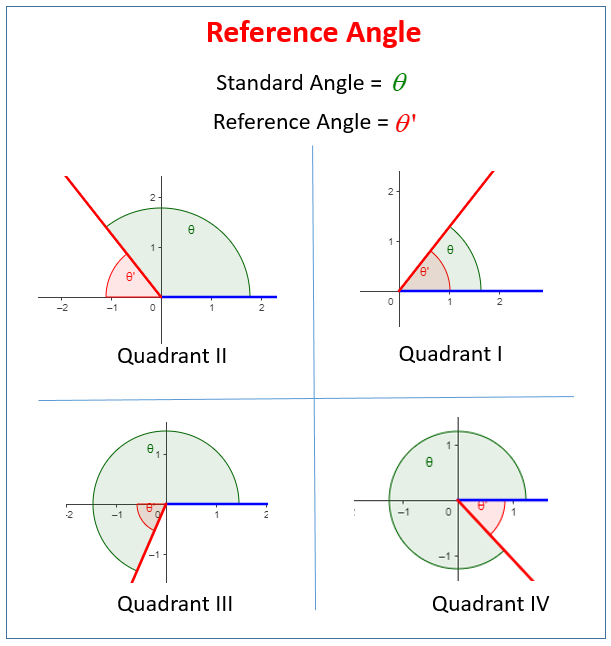 The following figures give examples of the standard angle and the reference angle for the different quadrants. Scroll down the page for more examples and solutions. What is The Reference Angle Theorem? 1. Determine the function value for the associated reference angle t'. 2. Depending on the quadrant in which t lies, the answer will be either be + or -. How to evaluate trig functions using reference angles? 1. Find the reference angle for the given angle. 2. Rewrite the original trig function with the reference angle. 3. Affix the appropriate sign to the trig function (+ or -), depending which quadrant the angle terminates in. 4. Evaluate the trig function. Discuss how to use the reference angle to evaluate some more trig functions.